Specializing in Cloth Diaper Cakes for all occasions! More than just diapers, these stunning diaper cakes make elegant center pieces for baby showers, or unique gifts that are guaranteed to be a big hit. 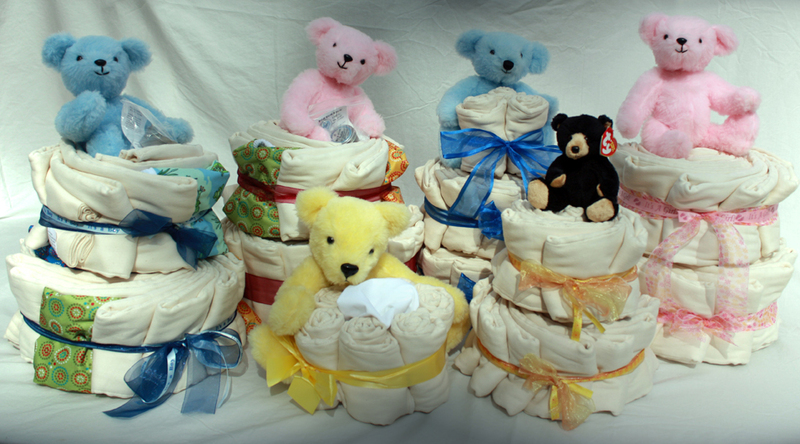 Our cakes are made with DSQ (diaper service quality) Organic, Unbleached Cotton Prefolds, wraps, and baby proof teddy bears! We have everything from the most basic "Cupcake" (6 diapers, and 1 wrap) to a more elaborate "Everything You Need Cake" (a 2 tier cake packed with everything a new mom needs to start cloth diapering!). The possibilities are endless! Each cake is assembled by hand and prepared when ordered with extra attention to detail. We use only brand name diapers and quality "ingredients". Every cake comes wrapped in cellophane, tied with a co-ordinating ribbon, and includes a card listing the "ingredients". Every cake can also be made with premium disposable diapers. Our cakes make a beautiful addition to any baby shower! Our business is speciality cakes designed for all needs and budgets. Don't see what you like here? Want a few other items added to the cake? Not to worry, contact us and we will be happy to create one taylored to your needs! All Prices are quoted in CDN funds!